It’s actually one of the most successful marketing strategies on social media. Neil Patel used it to increase his Facebook reach, Gary Vaynerchuk is dedicating his entire Instagram for his self-made inspirational quotes. 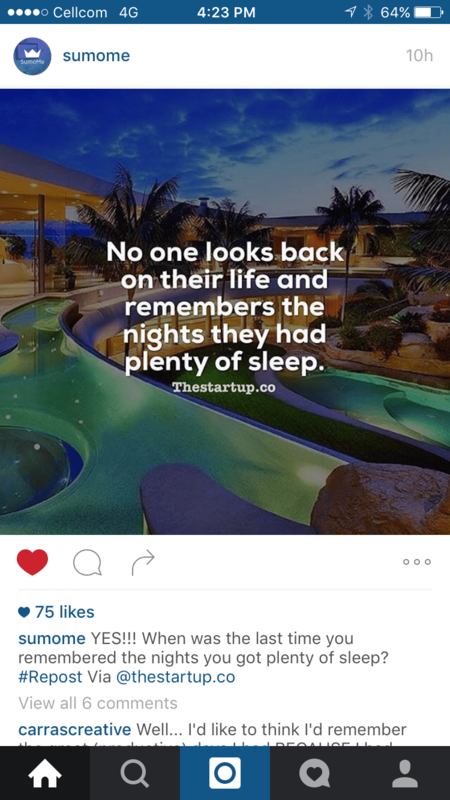 Hell, almost every entrepreneurial Instagram account is using those. The reason everyone is using it – is that it works. As much as we all to feel like we are individuals, we are actually kind of wired the same way. We all have our self-doubts, our highs and lows, our wins and lose, moments of discouragement or simple moments of insecurities. There are so many quotes that hit the lowest common denominator‏‏‏‏ that it bounds to effect every one of us eventually. Just for being humans and needing someone to believe in us, or strengthen us when we lose faith. That being said – today, a quote from Suomme’s account really got me. ‘No one looks back on their life and remembers the nights they had plenty of sleep’. This quote really got me. Why? I’m not a 100% sure. Maybe it’s because I feel like my life has become more ‘normal’ and it’s a reminder of crazier times. Maybe it has something to do with the passing away of David Bowie. Maybe it’s just about understanding that life is really short. But that’s the thing about these quotes, right? You don’t really get why they strike a nerve. But they just do. What quote got you lately?